The Q4 2018 Kansas City Tableau User Group included a visualization contest. 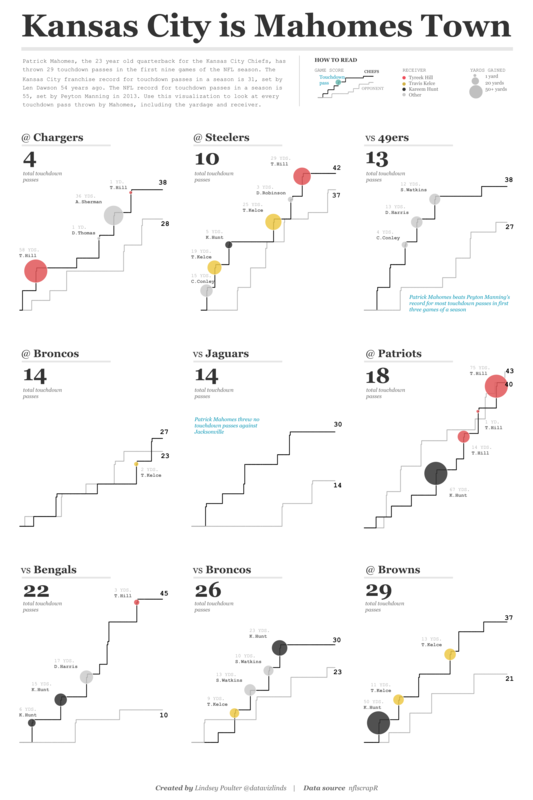 The goal was to create a viz that could be used in preparation for the KC vs. Baltimore game later in December (with a prize of winning tickets to the actual game). The data included play-by-play data for every Kansas City and Baltimore game this season. The instructions included building a viz that answered the following questions: how have the two teams performed in the past? What are the keys to (a Chiefs) victory? What are predictions for how the game will turn out? Attendees of the TUG grouped into teams and were given ~1.5 hours to create a viz. After time was up, Sean Miller and Ryan Sleeper would judge the competition. I arrived about 15 minutes late due to the snowy weather and my inability to navigate downtown Kansas City, so when I walked in the vizzing had already commenced. Sean had posted a sample of the data set in advance of the competition, but I admittedly did not look at it until I arrived at the TUG. Once I opened my laptop and began to do data discovery….. I realized how complex play by play data is (note to self: look at data beforehand if you are able to). If KC was the home team, I’d have to look at one set of values, where if they were away, it was another. I probably spent a good 45 minutes exploring the data and trying to find a story (that was also accurate). I also admittedly do not watch NFL very games often….. so I decided to keep it simple and focus on the one metric I knew the most about…. points scored. I do not very frequently time box myself for how long I can spend on something, so this competition really challenged me to move quickly. While this view is very simplistic (and doesn’t answer any of the questions required for the competition), I like how easy it is to see the trends and point differentials of each game. Fast foward to the following Monday night, where the Chiefs are preparing to play the Los Angeles Rams. Even as someone who doesn’t watch a lot of football, it’s hard to get around Kansas City (and Facebook) with out constantly being reminded of Patrick Mahomes. I had seen articles about Patrick Mahomes setting the KC franchise record for touchdown passes in a season and being offered free ketchup for life if he throws 57 touchdown passes this season. 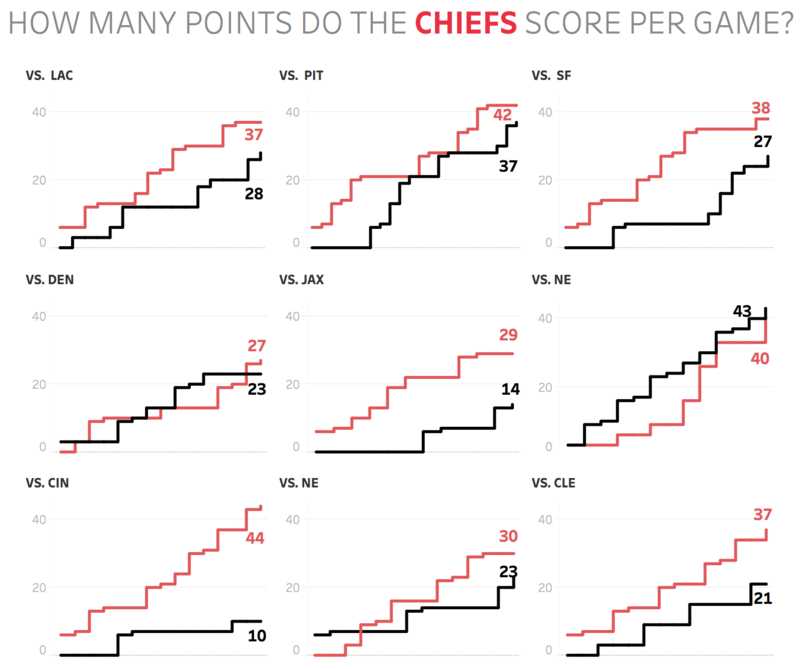 It made me curious if I could repurpose my KCTUG visualization to tell the story of each touchdown pass Mahomes has thrown this season. As of writing this, KC has played 11 games while the dataset I was using only had the first 9 games. Next week, after 12 games have been played, I plan to update my dataset in order to include the game where Mahomes broke the KC record (the 10th game) and to include the 6 touchdown passes he threw verse the LA Rams (the 11th game).